Fresh off the Mozilla stove, the FireFox Home app for your iPhone is here. Do you love your FireFox? Soon an iPhone app from Mozilla called FireFox Home will be released in the App Store that will let you sync and view your open tabs, history, bookmarks and more from any MAC or PC on the go. Firefox Home is secure from end-to-end so your data is always safe, and it’s free. The revolutionary FireFox Home iPhone app uses Firefox Sync technology that will give your iPhone live access to your Firefox browsing history, bookmarks and the set of tabs from your most recent browser session. The FireFox Home app also has a built in “Awesome Bar” that lets your navigate the web with minimal typing and much less hassle. 2. Reopen Firefox & create an account with both a password and a Secret Phrase for the addon and sign in. 3. 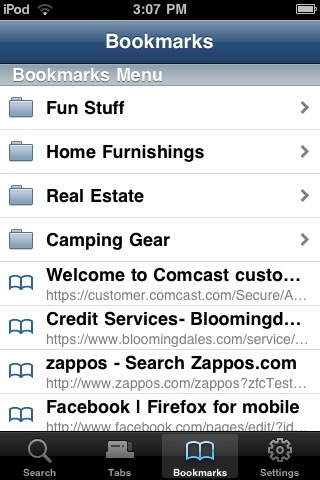 Download the FireFox Home iPhone app and enter your new account log-in info. If you don’t feel like remembering all these steps, the FireFox Home app prompts you when you open it up the first time, to see if you’d like the steps emailed to you. Just enter your email address and wait a few minutes for the email from Mozilla with help on getting started. Tired of double typing addresses you find on Google Maps? Don’t feel like checking the flight information site again that you already visited the night before? Don’t remember the URL to your recently visited news article? The list goes on. What’s great about this new FireFox Home app is the ease of unifying your computer life with your mobile life. For example if you find a nice list of places to visit on your trip just let FireFox Home sync and you’ll have them accessible from your iPhone when you need them. Update: Initially announced last month, and submitted to the appstore a couple of weeks ago, FireFox Home is finally in the App Store. Here are some screenshots. AppSafari review of FireFox Home was written by Joe Seifi on July 15th, 2010 and categorized under App Store, Featured, Search, Utilities. Page viewed 7282 times, 1 so far today. Need help on using these apps? Please read the Help Page.